A tree of ripen and bright mango for your long journey. You will have enough to fill your spirit bodies and bright mango will lit your way. Info: A 24-year old Tibetan, Sangdag Tsering, set fire to himself and died on November 17 in a township in Tsekhog in Rebkong, Qinghai. 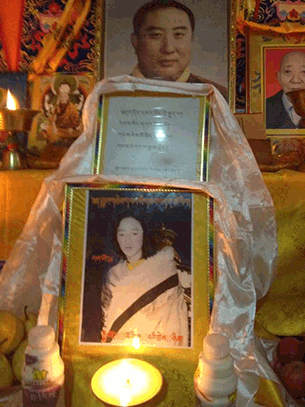 He was the second Tibetan to self-immolate on November 17, following the death of mother of two Chagmo Kyi. Sangdang Tsering self-immolated at around 7 p.m. on November 17 outside a government building in Dokar Mo township in Tsekhog (Chinese: Zeku/Zekog) county, which neighbors Rebkong (Chinese: Tongren), in Malho (Chinese: Huangnan) Tibetan Autonomous Prefecture in Qinghai (the Tibetan area of Amdo). Security personnel at the scene attempted to douse the flames with water but failed. Sangdang Tsering was married with a three-year old son. A Tibetan in exile said that Sangdag Tsering frequently spoke about the Dalai Lama not being allowed to be in Tibet, that Tibetans have no rights, and that the Panchen Lama is still in prison, referring to the young man recognised by the Dalai Lama as the 11th Panchen Lama who disappeared into Chinese custody at the age of six in 1995. DHARAMSHALA, November 18: In more alarming reports coming out of Tibet, another Tibetan passed away in his self-immolation protest yesterday evening in an apparent protest against China’s rule.